There are number of big super stars that were produced by WWE in past few years. Dwayne Johnson who is well known for his name (The Rock) earned huge fame after leaving wrestling and becomes one of the top paid actors in the Hollywood. 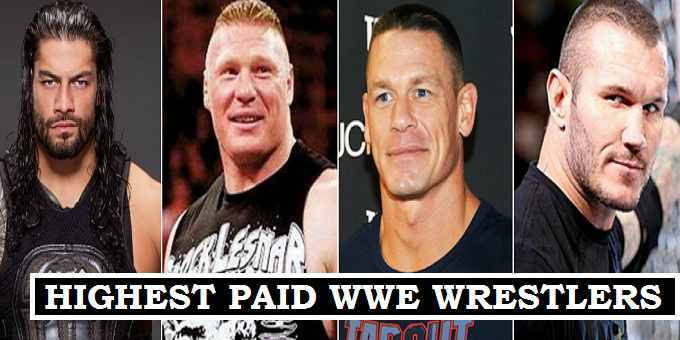 Currently Brock Lesnar is leading the list of highest paid wrestlers. John Cena is at second place with annual earnings $9.5 million. Wrestlers paid according to their performance during the matches. WWE super stars who won big ppv-event matches get extra bonus money. Not only this top wrestlers get accommodation and travelling expenses. WWE never public their super stars contract details. The earning details in the above table estimated. All the data collected from the top sources of wrestling its difficult for us to say that they are 100% accurate. Lesnar who is currently the active member of WWE Raw and Universal champion becomes the most paid superstar. There are some rumors ongoing that he will rejoin the Ultimate Fighting Championship. Brock Lesnar shares great rivalry with Roman Reigns, Tripple H, and John Cena. John Cena made his name among the peoples choice, he is most rated wrestler in 2016. Currently he is active member of Smackdown and making appearances and looking to win the WWE Championship title back from Jindar Mahal. Roman Reigns becomes the only wrestler who achieved huge fame with two years time period in World Wrestling Entertainment. He is roaster of Raw and looking to compete for Universal Championship in the upcoming pay-per view of Summerslam.